Elizabeth Corbin needs a man, specifically a husband, to secure a place on a wagon train going to the Dakota Territory. But, she wants a partnership without benefits and she's ready to barter.Noah Kincaid isn't sure what in the hell happened. One minute he's getting off his horse anticipating a drink and the next he's thrown in a hellhole of a cell. A few days later he has a raging fever and knows this can't end well. 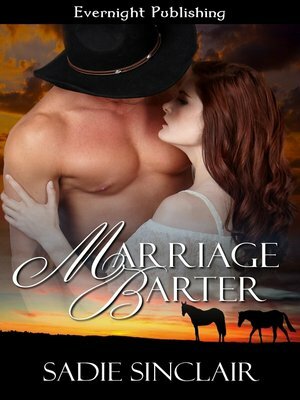 Then a fiery redhead literally bursts through the doors of the saloon/courtroom and things heat up.Elizabeth has what she wants, but as she learns more about Noah she realizes he isn't a poor cowboy and doesn't need what she has to offer. Not so as far as Noah is concerned. Maybe he doesn't need her money or land, but that doesn't mean he isn't interested.